A Durable Power of Attorney allows you to assign someone (an agent) to manage your finances if you become incapable or otherwise unable to do it yourself. 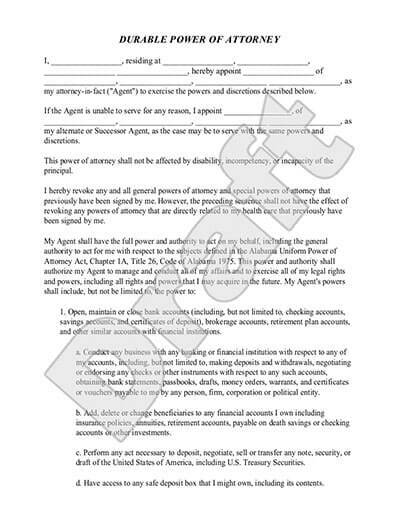 This is the most common type of Power of Attorney document and is simple to make. You want to appoint someone to manage your finances if you become incapacitated. You want to assign an agent to act on your behalf if you become legally incompetent. You want to assign an agent to care for your financial matters now and when/if you become incapacitated. After carefully choosing your agent or co-agents, you can make and print your Power of Attorney documents easily. To make it valid you will need to have it signed and notarized. Some states may also require witness signatures. A Durable Power of Attorney is a document used to assign someone (an agent) to act on your behalf regarding financial matters. Durable POAs are specifically active when you dictate them to be so, which may be while you are well and/or if you become incapacitated. You can decide exactly what financial matters you want your agent to be responsible for which may be everything or limited to specific financial obligations. 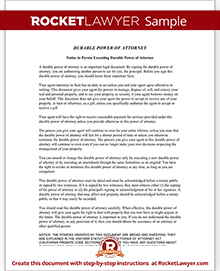 What do Durable Power of Attorney Agents do? Agents manage and have access to your finances. It is important that you choose someone you can trust completely. The person should be discreet, responsible and organized. It can be a family member or trusted friend. If you have a large estate, you may even choose to appoint your accountant or lawyer to act as your agent. Agents are responsible for your financial responsibilities including investments, bank transactions, insurance, claims and litigations, family obligations (child support, alimony or palimony, tuition), military retirement payments, social security payments, bills and debt payments, and taxes. While agents may not be responsible for making medical decisions for you, they may be the ones to make sure your medical bills and health insurance are paid. Your appointed agent is to act on your best behalf. This means you should choose someone that understands what your best interests are and how you might act in presented situations. If they should make a minor judgment error, it is usually forgiven. But if they begin to act recklessly or against your best interest, they could potentially lose their Power of Attorney (POA) by court decision. The document itself outlines many of the agent's responsibilities and expectations. You should discuss these obligations with them before finalizing the documents. If you or they don't feel they can meet your expectations, you may need to choose another agent. If you end up appointing your accountant or lawyer, you need to ensure you set aside enough money to pay their fees. When does a Durable POA take effect? It can take effect as soon as you sign it or when you become incapacitated if that is when you request it to take effect. If you are still able, you can change your Durable Power of Attorney at any time and appoint a different agent if you want to. If you are incapacitated, it can only be changed through the courts. Your family or others may request to change the POA if they feel the agent is acting irrationally or not in your best interest. Do I need a lawyer to make a Durable Power of Attorney? No, you do not. You can make this document legal by having it signed and notarized. Some states may also require that you have witnesses sign as well. While you do not need a lawyer, if you have a large complicated estate you may benefit from having your accountant review the details of the document before it is signed. As with all Estate Planning documents make sure that relevant parties have a copy of your Durable POA document. What's the difference between a Durable POA and a Power of Attorney? The difference between the two is minor but important. A Durable Power of Attorney can take effect whenever you want it to, even if you are alive and well. If you become incapacitated it remains in effect. Often a regular Power of Attorney ends when you become incapacitated unless the language is included to extend it (making it durable). Does this POA include medical decisions? Healthcare Power of Attorney: Use this form to appoint someone to make medical choices for you when you're ill or in treatment. Mental Health Power of Attorney: This type of POA is to assign someone to make your medical and mental health choices for you should you not have the mental capacity to do so. Advance Directive: This document appoints someone to carry out your end-of-life wishes. A Living Will can also fulfill this need for you. Our step-by-step interview process makes creating a printable Durable Power of Attorney easy.